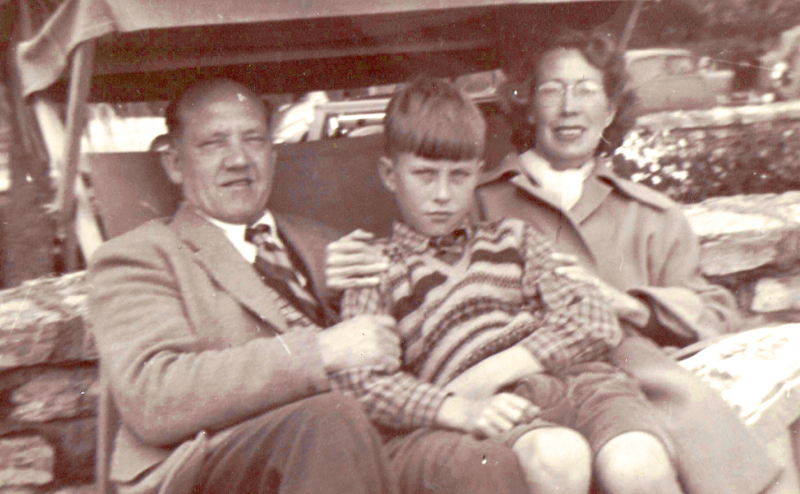 It’s been a tough ride for everyone; dad’s condition has defined my thirties as his joint carer with mum. But while our loss is of course sad, it’s tinged by a sense of relief that he’s no longer suffering. We had his funeral yesterday (October 3) and I toiled over every detail to make it as personal as possible. A large A3 black & white photo of him at the funeral with a lock of his hair, napkins embossed with the date of their wedding at the wake (left over from their wedding reception in 1979) and a memory book to have an everlasting record of fond anecdotes of him. It was a lovely send off. It’s therapeutic for me to write this in a public space, even though I’m privately grieving. When his funeral approached, I wrote his eulogy to read out at the funeral. It was without doubt the toughest, most emotional text I’ve ever written. I’d like to share it with you – it hopefully sums up now much I loved him. The last time I was stood at this lectern, I had just done my Confirmation. Dad was sat THERE… with mum, while I read a psalm to a packed church. It was a happy moment. This time though, it’s somewhat different. I knew I had to write something… I wanted to. But I couldn’t get started. So I turned to the internet for advice. One guide said find three words to describe the deceased. Seems like a reasonable place to start. I think that sums up dad pretty well. Jovial – because he wasn’t serious. Although he couldn’t tell a good joke (I don’t think he actually had any!) he always saw the lighter side of life. He’d rarely sit down to watch serious documentaries on the TV… He’d much rather an episode of You’ve Been Framed or repeats of classics like Fawlty Towers. Like me, his sense of humour was dry with a slight sarcastic edge. Sometimes, I could never tell if I should take him seriously or not. Gentle – because he wouldn’t hurt a fly. He’d give the best cuddles when I needed them (because of the extra padding, he would say!) and showered me and mum with love. He cared for us and we cared for him in return. And reliable – just because he was. He’d rarely let anyone down and when I needed help, he would do just that. I remember one time my car broke down in Leicester. He could have called the AA… but no, he just drove up and fixed the problem there and then. He was also my reliable mechanic for my first car – the infamous 1978 brown Vauxhall Viva! My street credibility was in tatters… but dad still toiled over making it the best ride possible. 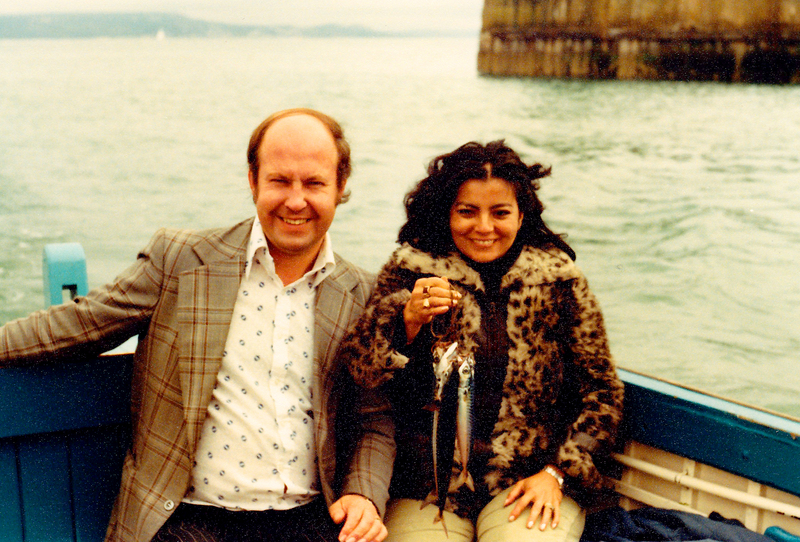 In the early days of my parents courtship… he reliably wrote love letters to mum on her lengthy home visits to Colombia. So reliable, so lovely. Dad was an only child, born to Bernard and Gladys in South Ruislip, in the final throes of the second world war on August 1 1944. He was educated at Queensmead School – and it’s so lovely to see some of his old school mates here today. When he was 15, he started his apprenticeship in print with Weekly Post Newspapers LTD in Ickenham in 1959, passing in 1965 – and enjoyed a long and distinguished career in the printing industry until his retirement. He met mum at a dance in London on Friday December 15th 1978 – at the Cafe de Paris, while she was over studying English. In the early days of their relationship… with dad not speaking Spanish and mum knowing little English, they communicated by pointing to words in a dictionary. I think another word to describe dad would be patient! They married the following year on September 8th 1979 when he was 35 and had me, their only child in 1983 while living in Field End Road in South Ruislip. 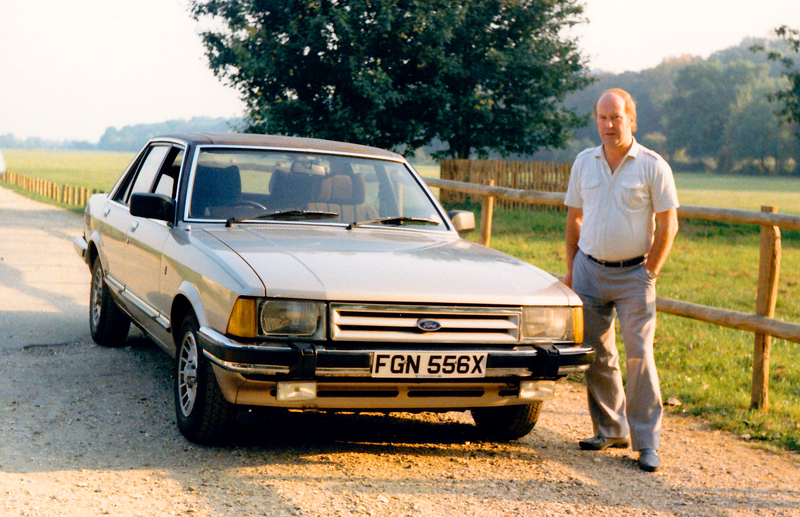 Aside from his new born son, his other pride and joy was his Ford Granada. Perhaps he took you for a ride in it! Dad converted to Catholicism in the 1990s, here in St Matthews, which is why this place is so special to us. Dad was often happiest when left to his own devices. The occasional fishing trip, the odd round of golf or just tinkering around in his garage. He liked to keep hold of his old stuff – if it meant something to him… even if it was broken. The Sanyo music system from the 1970s has been gathering dust for 20 years. ‘Lets chuck it!’ I say. ‘No, I played many a good record on that and it’s staying where it is’, he’d respond. Old car stereos… old rusted tools… even the broken ladder he fell off and broke his leg on over 30 years ago. All still there. 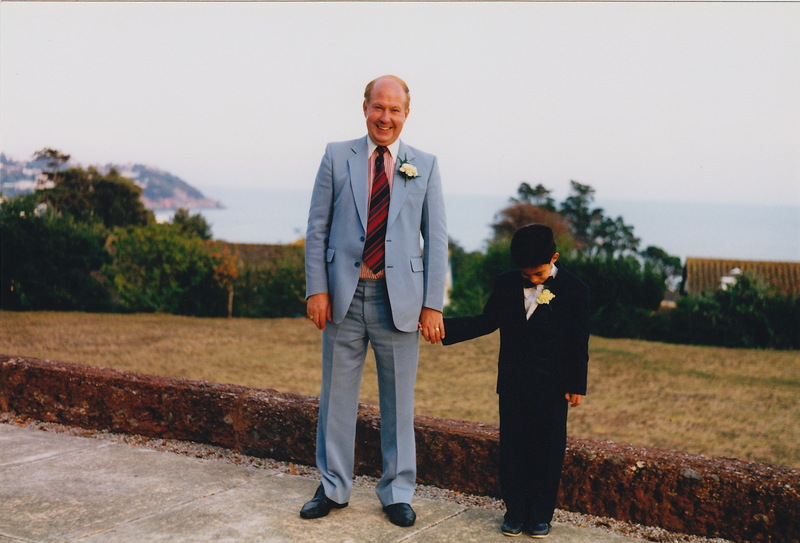 One of his most precious items though was the suit he wore on his wedding day. He definitely couldn’t throw away that. 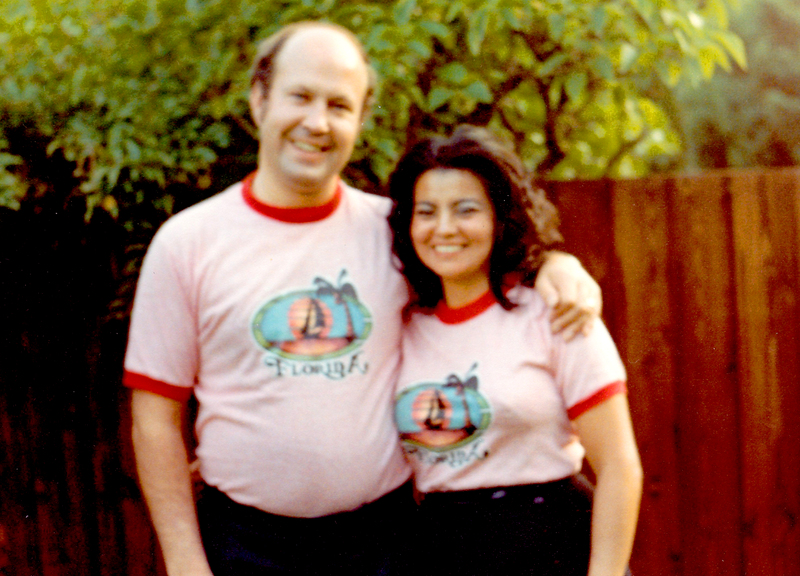 I remember on every wedding anniversary, he would wear the same shirt he wore then… a tradition he kept until all the buttons popped off when I was a teenager. Even though he’d lost a lot of weight in recent years, he’d still occasionally get the suit out for those special times when only the best will do. We saw him yesterday in the chapel of rest. He looked peaceful, serene and rather dapper in his favourite suit with shining white shoes. It’s difficult to imagine him not being around and I’m not sure how we will all cope. It’s strange to think that I can’t just give him a call or pop around to see how he is. Dad lived a happy life, but succumbed to ill health in the last decade. 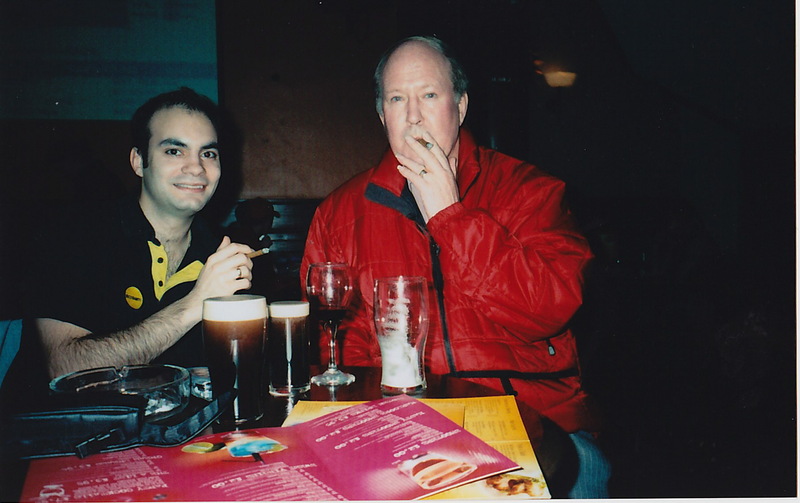 We still enjoyed the odd Guinness, and when mum wasn’t looking, the occasional cigar. Sorry mum! So that’s what I’ll be drinking later in honour of my old drinking buddy. I can’t read this without thanking mum for caring for dad while he toiled with the demons of Parkinson’s Disease and Dementia. Mum sacrificed a lot to care for dad at home and I’m positive his life was enriched, prolonged and made easier for the care mum provided. She was determined not to send him to a home… the family one at Briarwood Drive was the very best place for him. 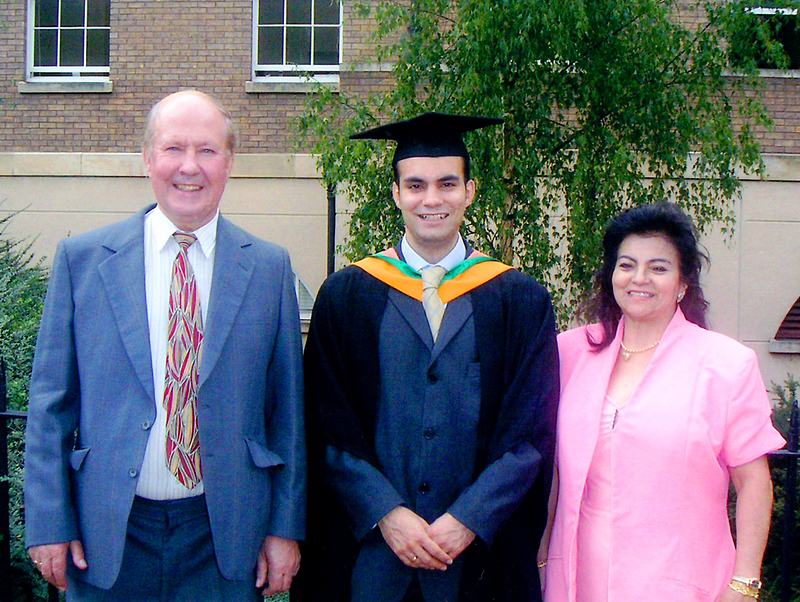 Thank you mum, me and dad owe you a lot. You kept to the vows your pledged on your wedding day – especially the in sickness and health part – right up until the end. Dad couldn’t ask for anymore. Dad was quite ill during the last few weeks of his life, but we are grateful for the small blessings. 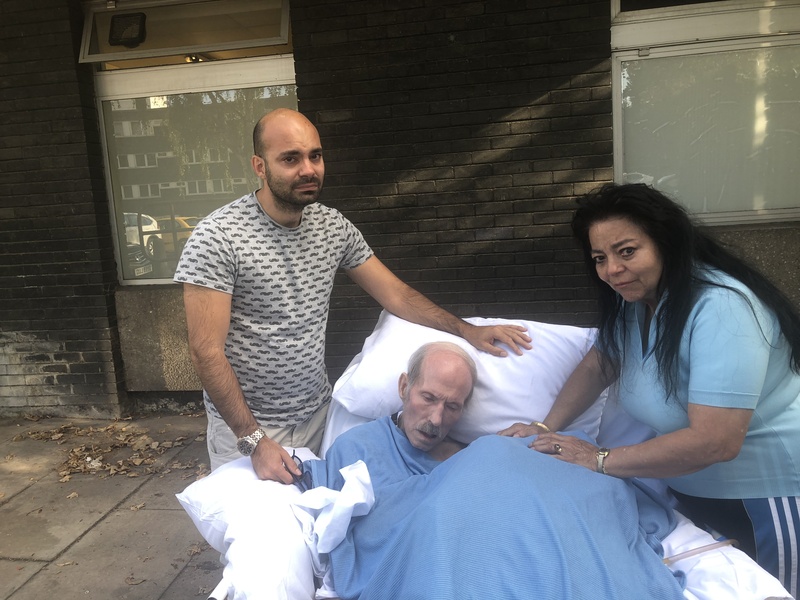 He spent a month at Watford General Hospital – a ten minute walk from my flat, ideal so I could see him every day and feed him lunch. When we realised we didn’t have much time left with dad, we all said goodbye and we stayed with him right until the end. We said what needed to be said, we said we loved him and I told him I hope I made him proud. Making dad proud has always been at the front of every objective of mine… from playing him my latest song on the piano or by showing what interesting things I’m doing for work. I hope he’s looking down on me now proud and feeling as loved as he did on earth. Sadly, dad will never get to see me marry the woman of dreams or hold a grandchild… but dad, if you’re listening, please guide me and my children when I eventually become a father. If I could be half the father you were to me, I would be a very good father indeed. Family has always been important to us and ten years ago we started on our journey to discover more about who we are and where we came from. 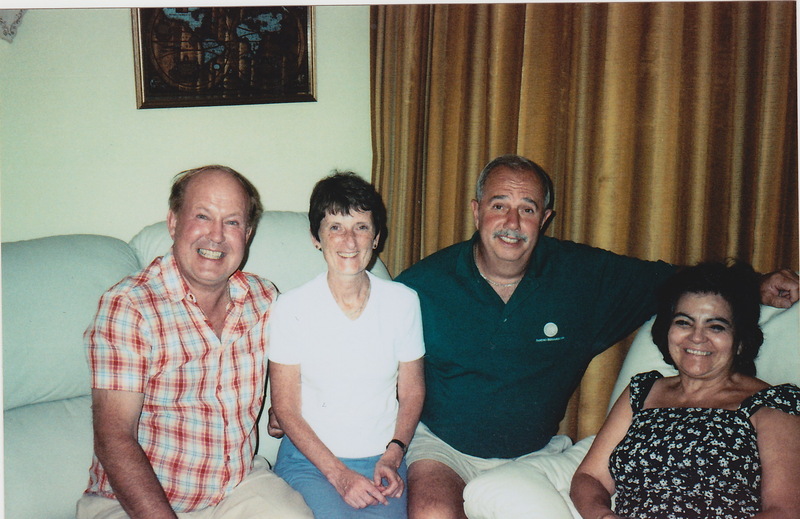 Between me and dad we stretched out family tree back to the 1700s and discovered that my great grandmother – his maternal grandmother – is buried at Northwood in an unmarked grave. One day, we took the short trip down there armed with a reference code and found it. He said it’s hard to imagine but in this very spot, my parents and their families gathered round to watch their mother be buried. 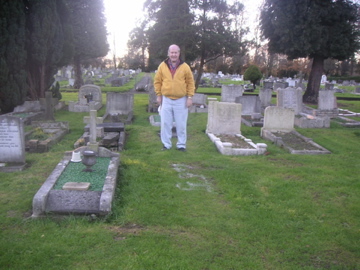 I thought it would be a nice idea to take a photo of him stood by the grave, as a reference so we knew where to go next time. You can see it on the back of the order of service. When dad died two weeks ago, we had a think about what to do with dad. 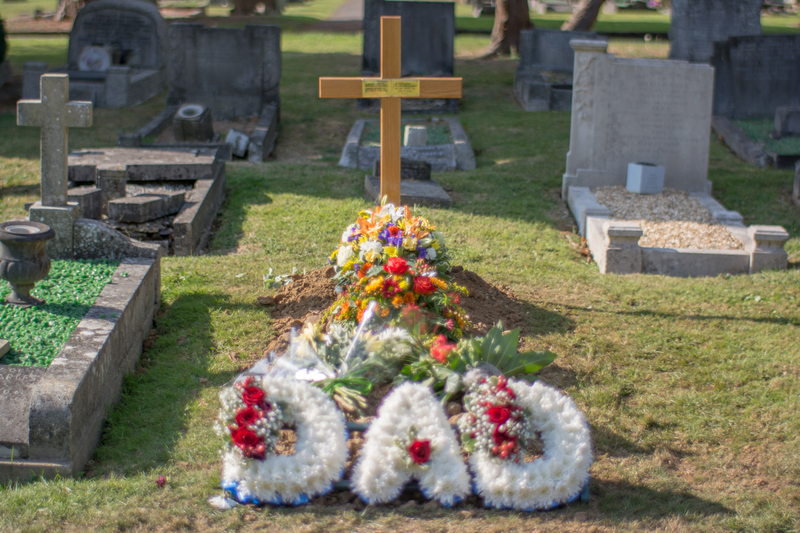 He told me he wanted to be cremated years ago… but he told mum more recently he wanted to be buried. He could never make up his mind! Then I remembered that photo. What if dad could join his gran? We made enquiries and found out the rights to the grave is owned by my second cousin in Devon. I’d like to thank Deborah, Paul and Delcia for transferring it over to me so that dad can be reunited with his grandmother. And you’re all invited to the burial. So a friendly warning to you all – next time someone takes a photo of you stood next to a grave, that’s where you could be ending up! 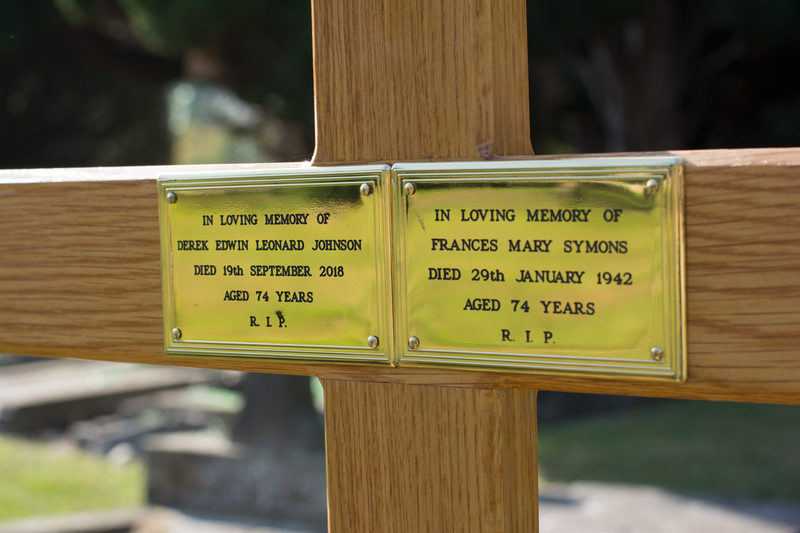 Me & mum saw dad’s grave yesterday (October 5) for the first time together since the funeral. It was incredibly calm, peaceful and soothing for our aching hearts to be there. I was especially pleased that my great grandmother’s grave is now finally marked for the first time since 1942, now that dad has joined her in the same space. The grave looked beautiful. I’ve opened up a lot more to mum about talking about her funeral since it’s been a hot topic with us lately… us Brits aren’t usually known for talking about such morbid subjects. But there’s nothing like a close death to get the conversation started. She wants to join dad in the same grave, and when she does, I’ll commission an ornate gravestone to permanently reference their location for generations to come. After our visit to Northwood cemetery, we went to Breakspear Crematorium in Ruislip to see where dad’s parents’ ashes are interred. Although there were no visible signs at the spot where dad scattered them over 30 years ago, the visit there felt like a suitable conclusion to a day where our emotions were strained, but eased. It sounds odd to say, but I’m looking forward to making dad’s grave a sanctuary for me to visit for years to come. A special place we both visited in our search for my great grandmother, a special place were I can now pay my respects to both. Fantastic eulogy and as you know I conduct quite a few funerals. I always enjoyed seeing Derek at The Wright Stuff and I’m sure that he would have known just how much you loved him. May the Lord Comfort and Bless you and your Mum at this sad time. This has left me in tears….a beautiful heartfelt eulogy and I’m sure your wonderful dad will be very proud of you….